Welcome to Antonio’s Real New York Pizza! Yes, we are really from NY; 5 of our employees moved directly to CO from Long Island and the Syracuse Area! Antonio and his family arrived in 2006 straight from NY. Our pizzeria was created out of necessity with the necessity being real New York pizza. Established in 2014, we innovated and learned and innovated some more. By 2017, we outgrew our original location and moved the entire operation in 2018 to 1560 Big Thompson Ave., which is almost 6000 square feet! We have seating for 150+ in this location, two fireplaces, 14 beers on tap and two outdoor patios. How did we do it? Attention to detail, never sacrificing when it comes to ingredients, quality or any step of the process and we continue to learn, every day! Our second location- Antonio’s NY Pizza Downtown is a slice house that is open from May to October. What do we offer? 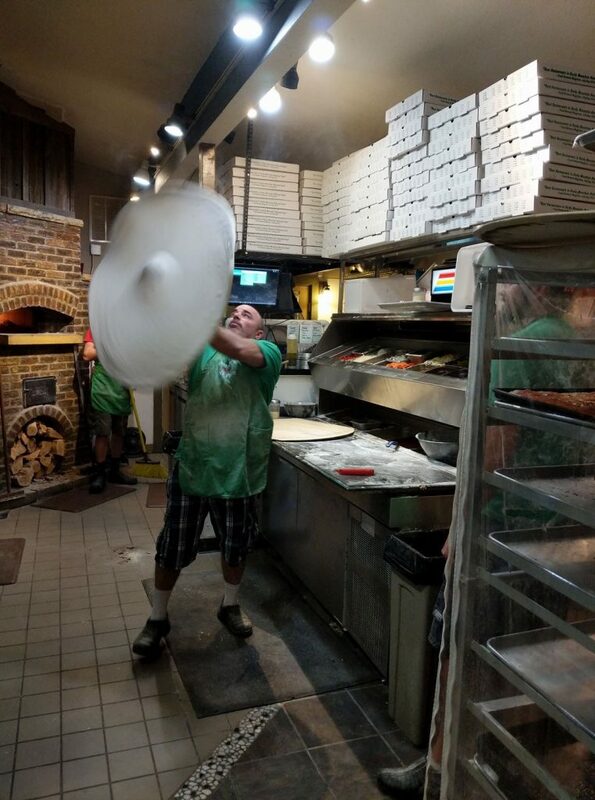 Real, hand-tossed, New York Pizza. The kind you will find in NYC, Brooklyn, Queens and Long Island. When we first opened in Estes, very few people knew what a Sicilian Pizza was and even fewer had heard of a cannoli. Well, it took a while, but the year-round residents of Estes Park now know what both are and tell anyone who will ask about us. We are very grateful and fully support this community through initiatives aimed at helping those in dire need. We do so on a weekly basis and the more we’ve grown, the more we’ve done. It’s a wonderful experience to give to those who support you. This pie is a 26″ pizza called the Mega Don. It weighs about 5-6lbs after being baked and feeds many. We also have a 36″ dine-in-only pizza called the “Tony 3-feet”. Downtown Express: 100 Cleave St.